“Calling the Shots in Your Medical Care” – A Review & Giveaway! 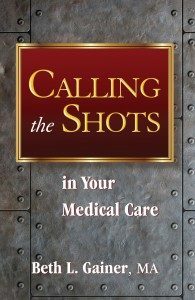 I have been looking forward to reading Beth Gainer’s book, Calling the Shots in Your Medical Care, ever since it came out this past July. I am a big fan of Beth’s blog, also called, Calling the Shots. I’m lucky to call Beth a friend of mine, and even got a chance to meet her a while back. 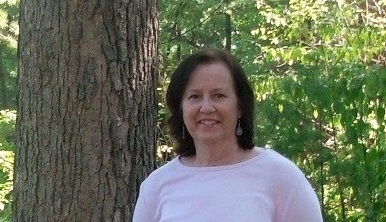 Beth’s blog was one of the first I started reading after starting my own blog. Back then, I definitely needed advice on calling the shots in my medical care. I still do. Who doesn’t, right? This short book is designed to encourage and inspire you to take the reins of your own medical care. Like a lot of things, this is easier said than done, right? There is lots of talk these days about patient empowerment, but what does this even mean and how does a patient go about becoming empowered? How does a patient figure out how to find the most suitable doctor, what questions to ask, how to change doctors, how to not feel guilty about “bothering” doctors, how to go about getting a second or third opinion, how to speak up, or in other words, how to call the shots in your medical care? Calling the Shots in Your Medical Care can help you figure this out. Gainer shares things she learned from her personal experience in navigating the medical system following her breast cancer diagnosis and how she evolved from being a passive, quiet, do-as-your-told sort of patient into a proactive, not-afraid-to-speak-up one. She acknowledges it’s hard and frustrating at times, but so worth the effort in the long run. Because let’s face it, YOU are your own best self-advocate. You have a right to have doctors return your phone calls on a timely basis. In “Part I: Hiring and Firing Doctors”, Gainer offers concrete tips in her “Time to Run” checklist. I love this as I’ve had to “run” from a couple doctors myself. I’ve had five oncologists. Yes, I said five. And no, I am not a difficult patient. If you do decide to break ties with a doctor, Gainer offers tips on how to go about it because even just walking away can sometimes be intimidating and not that easy to do. Of course once you do fire a doctor, it can be overwhelming finding a new one too. This is where Gainer’s eight litmus tests to assess whether a doctor is right for you come in handy. Part II is called, “Achieving Doctor Buy-In,” which really just means having your preferences, medically speaking, listened to, respected and followed when appropriate and feasible. Gainer offers ideas and encouragement on how to achieve this. Bringing issues to your doctors’ attention is your job…A physician is not a mind reader and cannot help you if you do not speak up about how you are feeling. Have you ever felt like you were losing control of your life during cancer treatment? Nodding your head about now, aren’t you? I love Gainer’s “Taking Control” checklist, as well as her “De-stressing – Packing Your Toolbox” list of suggestions to try out when you find yourself passing time in waiting or exam rooms while trying to ward off anxiety and worry. For example, she suggests listing 10 words that make you feel empowered, each on a separate note card. Gainer’s suggestion to bring the cards along to appointments to look at while waiting sounds like something I might like to try. Part IV is called, “Civil Disobedience,” and covers things you can do to address those times when you feel you are being treated poorly, unfairly or disrespectfully by doctors, nurses, or anyone else in the medical environment you find yourself in including, receptionists and other administrative staff. You can advocate for yourself. All you have to do is tap deep within you and act. And you will be the ordinary person who does the extraordinary. You are powerful enough to advocate for yourself and loved ones. And know your hero. It is not your doctor. It is you. Are you feeling a bit more empowered already? 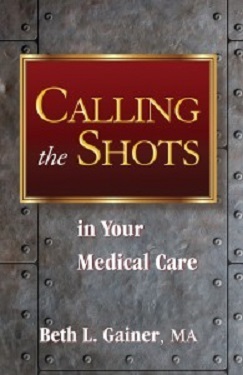 I’m giving away a FREE copy of Calling the Shots in Your Medical Care to one lucky reader. To enter my giveaway, leave a comment by 5 pm on Tuesday, December 6th stating why you want to read this book and you’re in! The winner will be announced via this post, Facebook and Instagram shortly thereafter. NOTE: The winner is Betty! Congrats, Betty and thank you to all who participated! Carol, Right now it looks like your odds of winning are really good! 🙂 We shall see, right? Right now all is well with me and my close friends, but it won’t always be that way so I’d like to have the book as reference to use for me or a friend. Just reading the review reminded me of some points that I forget in day to day normalcy. Thanks. Betty, Glad to hear all is well with you and your close friends. Good luck in the drawing. Thank you for participating. I find that being a full time patient, I have gotten worn down. I feel I am learning to lower my expectations, and “get in line” over time, and have stopped effectively expressing concerns I have. I also tend to feel that other patients must be more important/needy/pleasant—or something–so that they elicit more engagement with their medical team. I would love to hear some ideas on how to improve this situation. Barbara, Many of us are quite familiar with that worn down feeling. 🙁 This book is full of good ideas for becoming more proactive. Good luck in my drawing. This book is timely as I’m at the point that I must make decisions how I want to proceed with one of my medications. There are moments I feel railroaded by the doctor even as I speak my mind. There’s a great deal of fear-whether real or imagined. Thank you, Nancy, for your wonderful view of my book. I so appreciate it! Beth, You are very welcome. It’s a very helpful, use-friendly guide. What If You’re Not Feeling All that Grateful this Thanksgiving?